Have you checked the price of bath towels, washcloths and hand towels? With the cost of household items so high, practical sewing will pay for your sewing machine in no time. Practical sewing includes alterations and recycling. Towels get a workout, and January is white sale month in many stores. If you need new towels, don't throw out the old ones. Use them wisely. Towels often wear on the edges first, and you can only trim the fringe a number of times before the towel isn't quite fixable. That's when you need to make some washcloths or hand towels. Find a washcloth in a size you like to use for a pattern. Lay the towel flat on a cutting area and cut as many washcloths as you can from one towel. Cut squares, then round the corners. Thread your sewing machine with thread matching the towel. Set the sewing machine for a close zigzag stitch, almost like a satin stitch and about 1/4 inch wide. If your sewing machine doesn't zigzag, fold about 1/4 inch seam allowance. Stitch around a washcloth and see how it works. If you have trouble with stitching around the edge or if the stitches gather the fabric, you can place a piece of white tissue paper under the stitching area. Once you stitch the washcloth, you can wet the paper and remove it. If you use hand towels, you can also make hand towels from worn bath towels. Choose a hand towel in a size you like to use as a pattern. Lay the bath towel on a flat surface for cutting and pin the hand towel in place where the bath towel fabric is not worn. Cut about half an inch larger all around the hand towel pattern. Cut as many hand towels and washcloths as you can from the single bath towel. 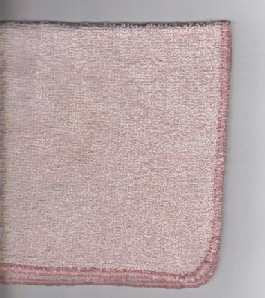 Fold 1/4 inch seam on the long side of the hand towel, and fold 1/4 inch seam again. Stitch each side of the towel with a straight stitch. Do the same for the ends, unless you want to add ribbon, lace or eyelet. If you choose to add a decoration, turn 1/4 inch under and stitch with a running stitch. Pin the decorative edge to the end of the hand towel and stitch again, turning the edge under on each side. If you need new towels, purchase sale towels to match the washcloths and the hand towels you made. 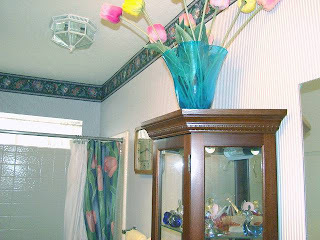 Your bathroom will have a new look and you'll have saved a substantial amount of money with little effort.